Biofuel stoves are targeted as wasteful, dirty, and dangerous. Experts agree that cooking with biofuel is an activity that requires development intervention and modernization, even though users themselves may prioritize other needs. One clear point of consensus is that cooking with biofuels indoors, over open flames, is very harmful to respiratory and pulmonary health (Smith 2000). At the household level, burning biofuel indoors is linked to emissions of smoke and particulate matter that harm the lungs, heart, and eyes. At the ecosystem level, fuelwood collection is linked to deforestation and the degradation of forest resources, as well as increases in the vulnerability of women to injury and sexual violence. At the planetary level, burning biofuel is linked to atmospheric carbon and global warming. Despite an intense and longstanding focus on rural cooking practices, there is no consensus regarding appropriate solutions. Some argue that from a health perspective, the only viable and just solution to the problem of biomass cookstoves is a massive investment in new infrastructure capable of bringing clean energy to rural people who have little expendable income (Smith 2002). In this view, all people should have access to clean cooking rather than to incrementally improved stoves that may reduce smoke but compare poorly with existing chulhas in functionality and durability. Others argue for continued efforts to improve biofuel stoves. One reason is pragmatic: it is unlikely that the poorest people in the world will obtain access to alternatives any time soon, so biofuel gathered from the environment will continue to be the primary cooking fuel used by many for some time (Jagger 2017; Jagger and Jumbe 2016). A second reason to continue improving biofuel cooking technologies is that from a climate perspective, replacing renewable and locally sourced biofuel with fossil fuels—whether gas or electricity from coal-fired power plants—is hardly a desirable goal (Kikkeri 2017). If we factor in—rather than bracket out—the energy used for fossil fuel extraction and efficiency losses at every transfer point as it moves from source to household consumer, it becomes less clear that the use of locally available biofuel is a big problem. Rather than shifting to fossil fuel energy, it may be better, some say, to focus on reducing the stove emissions harmful to health and climate. To this end, many actors with varied goals have tried to change the way rural people cook in developing countries by engineering, manufacturing, and distributing improved stoves. All such stoves aim to improve the lives of the energy deprived, and their intended beneficiaries are those people whose search for gathered—not purchased—fuel is a part of daily life (Yadama 2013) and who lack access to the cooking technologies preferred by wealthier families the world over, namely electricity and liquefied petroleum gas. The smokeless chulhas reduce smoke inhalation by redirecting smoke out of a house through a chimney. In the early 1980s the Indian government funded training programs to construct and use one such smokeless chulha, the “Nada Stove,” designed by Madhu Sarin and her Haryana village partners. The training programs, though ambitious in number, lacked sufficient resources and resulted in chulhas that were too tall, pot openings that were too small, and chimneys that didn’t provide adequate draft to make the stove function properly. In addition, the introduction of chimneys in communities with thatched roofs introduced dangerous new fire risks (Chandrashekhar 2015). Reflecting on the process, Sarin (1986) described how village women were already improving their stoves, but when the government got involved, the massive scaling up and standardization of these improvements led to failure. In personal communication with us she further observed that the diversity of chulhas found throughout India is testament to the ways that poor rural users have long been modifying stoves, even if outside experts do not recognize such efforts as technological innovations. Non-literate village women are, and always have been, technological innovators. Fig. 1. This high-efficiency cookstove manufactured by Envirofit increases cooking efficiency but requires smaller diameter fuelwood, causes certain foods to cook unevenly or burn, and exposes children and cooks to burn risks. Spider webs and dust seen in the side view indicate this family has decided not to continue using this stove. By contrast, “high-efficiency cookstoves” such as the Envirofit stove (Figure 1) reduce emissions and wood usage by restricting the addition of wood to the fire, limiting heat loss, concentrating flames, and improving airflow (Dalberg Global Development Advisors 2013; Sinha 2002). These improved cookstoves often introduce other kinds of problems. Reductions in the size of the fuel opening to minimize heat loss, for example, require chopping large pieces of wood into smaller pieces, a time-consuming and laborious task. Adjustments intended to concentrate flames decrease the flexibility of the stove to accommodate cooking utensils for different meals. Stoves made of solid metal expose cooks and children to burn risks. Some models are so complex that villagers cannot fix them without specialized tools, resources, and knowledge. Most are too expensive for villagers to buy; for households living on a dollar a day, a high-efficiency cookstove can cost up to a month’s income. Where these new technologies have entered homes, generally due to the efforts of governments and nonprofit organizations, there is little evidence of long-term use. These efforts have raised questions about how best to measure “adoption.” For example, research on long-term use in real-world settings suggests that the potential benefits of improved cookstoves based on testing in lab conditions “go up in smoke” when these new technologies fall into disrepair and disuse (Hanna 2016). Puzzled by the persistence of efforts to replace the chulha in the face of repeated failure, we (Khandelwal et al. 2017) decided to step back and take a big-picture approach to understand this intense focus on stoves over and above other problems faced by the rural poor. What we found is that a variety of actors have centered on a set of intertwined goals: improving health, solving a fuelwood crisis, stemming deforestation, empowering women, and addressing climate change. As new concerns have arisen over the last hundred years, these have not displaced previous goals but rather accumulated over time. The chulha is a condensed symbol with many different meanings. Cooking interacts with other aspects of rural life: technology, housing design, women’s labor, availability of biofuel, seasonality and region, livestock grazing, labor migration, and cash income. Thus, it is inherently difficult not only to standardize improved stoves that will work in different contexts, but also to measure their impacts over time and across locations. Lab-based and top-down efforts to improve stoves have been frustrated by such complexities. In January 2017 we (Khandelwal and colleagues) visited the Biomass Cookstove Test Centre at Maharana Pratap University of Agriculture and Technology in Udaipur, Rajasthan. This is one of four such centers funded by India’s Ministry of New and Renewable Energy that certifies manufactured stoves for both business ventures and nonprofits. During our visit we watched an engineering student who had just passed her doctoral defense demonstrate the stove she had designed for use in rural India. In the next room a “no photography allowed” sign hung above neatly arranged rows of improved stoves, an indication of the proprietary interests attached to these models. These improved stoves are all designed to be household technologies. They are small in size, portable, relatively simple, typically lightweight, and modestly priced. In India they are the flipside of the large-scale, capital-intensive projects such as mega-dams and power plants built to provide energy services to urban populations but provoked critique and resistance for ignoring environmental concerns and the rights of those they displace (Baviskar 1995; Birkenholtz 2016). They are humanitarian goods in that they are inexpensive, scalable devices designed to alleviate suffering and save lives; they are also little development devices in that they envision social transformation by modernizing rural kitchens to improve human health, standard of living, and forest resources. Stoves can be both gifts and goods. As with solar lights and other technologies made for socially distant others, improved cookstoves slide easily between the categories of humanitarian gifts subsidized or given for free, and the humanitarian goods designed, patented, and sold by national and multinational corporations in the name of social entrepreneurship (Cross 2013). Although some experts push for a market approach to improved stoves, many of the stoves manufactured by private companies are sold to humanitarian and development organizations that then offer them as gifts. Yet regardless of whether they are sold or given away, the improved stoves designed by experts who are socially removed from users continue to face the same obstacles to adoption and replicate the same lack of follow-through. Improved stoves are typically promoted by outsiders in a top-down mode rather than produced in response to demand on the ground. They are often promoted by powerful agents to save lives or to improve the welfare of people who lack access to modern energy infrastructure, such as those residing in rural areas or in hastily constructed refugee camps. Humanitarian and development efforts are plagued by lack of long-term investment because donors prioritize short-term projects, resulting in a chronic lack of attention to the repair and replacement of improved stoves. There are many reasons that well-intentioned efforts to diffuse improved stoves have not succeeded in India, even when they can demonstrate (in a lab setting) reductions in fuelwood use and/or harmful emissions. These reasons have been well documented in myriad case studies. They include cultural dissonance, a mismatch between the goals of stove promoters and those of rural people, the poor performance of stoves that do not live up to big claims, the burden of buying new cooking vessels or chopping wood into smaller pieces, underestimation of the benefits of traditional chulhas that are easily built and repaired, and a poor implementation process (Khandelwal et al. 2017). Given the problems encountered with smokeless chulhas and high-efficiency stoves, the staying power of the chulha is not surprising: it is naturally insulated to avoid burning a curious hand and to reduce heat loss to the surroundings, it is built to accommodate common cooking surfaces (tavas and pots) and meals perfectly, and it doesn’t require excessive chopping of wood. There is one inefficiency of the traditional stove, however: limited airflow. Placement of wood on the dirt floor of the stove limits the air available for combustion. 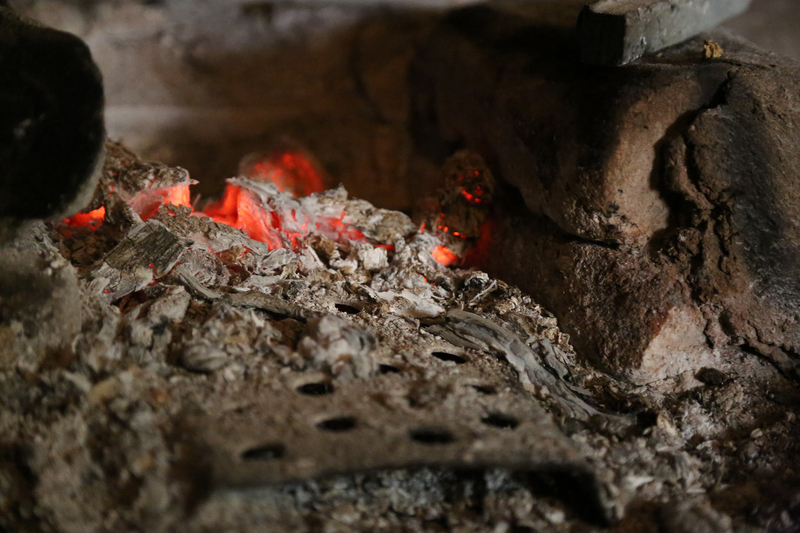 During meal preparation, ash accumulates and smothers firewood and embers that break off from the wood. The energy in unburned embers is not effectively used for cooking, so more firewood is needed per meal; these embers also emit more smoke and harmful air pollutants as they smolder in the stove. Is it possible to improve the three-stone hearth while preserving those aspects embedded in the cultural economy of the rural kitchen? This is the question that motivated a team of engineers and social scientists in a University of Iowa research group who, although fully cognizant of the problems plaguing improved stove programs, did not dismiss outright the potential for technological innovations introduced from the outside to improve people’s lives. 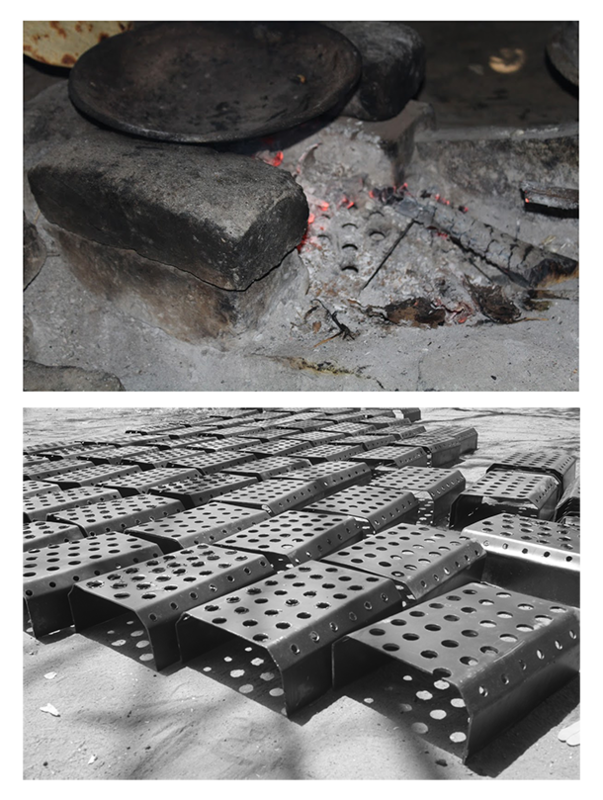 Based on the principle that efficient combustion produces less smoke, they designed the Mewar Angithi (Figure 2), a simple steel grate inserted into existing chulhas (Udaykumar et al. 2015). Named after the region of Mewar where it originated, the insert improves airflow by creating a channel between the stove floor and firewood. This separates ash buildup that can smother unburned wood and catches larger embers, allowing them to combust more completely. The engineers showed that without introducing any new obstacles, this simple addition to existing stoves compares in wood savings and particulate emissions reductions with the most efficient natural draft high-efficiency cookstoves on the market. Most important, the Mewar Angithi is affordable for most villagers at a cost of only a dollar, flexible in that it can be used with existing cooking technology, and durable because it lacks moving parts and delicate materials. Fig. 2. The Mewar Angithi, a simple metal grate insert, is designed to improve airflow to flames to improve combustion efficiency and reduce wood usage, cooking times, and particulate emissions. Source: Rebecca Kauten (top). In tests conducted at the Biomass Cookstove Test Centre in Udaipur, the insert reduced wood usage by 63% and soot production by an impressive 89%. Seeing these results, all researchers involved were eager to deliver the device to villages and conduct more field tests. Could these results be produced in real kitchens? Could this reduce the time women spend collecting wood or smoke-related illness? In 2015, Kayley Lain and Sailesh Rao arranged the distribution of 1,000 Mewar Angithi units in five Rajasthani villages to test the performance of the device in the field. A local steel fabricator produced the units and a nongovernmental organization (NGO) partner, the Foundation for Ecological Security, managed the distribution process. Testing these units in homes revealed an average of 33% reduction in wood usage in seven households. Particulate matter reductions as high as 51% were observed in one household with an average reduction of 33%, although these measurements involve many more variables than wood consumption and will require considerably more data to reduce uncertainty in these figures. The engineering team conducted additional hybrid lab/field tests at the University of Iowa by building and testing a chulha using utensils brought from Rajasthan in an enclosed structure meant to replicate household conditions in a village; this method produced more data than observing daily cooking in village homes, but was more realistic than testing in ideal lab conditions. These tests showed a 31% reduction in large (~10 μm) particulate matter, which is in line with field data. Lain and Rao surveyed village users six months after distribution and heard responses such as, “When I use the Mewar Angithi, smoke doesn’t make my eyes water while I’m cooking.” Many reported shorter cooking time (presumably due to hotter, more efficient fires) and reduced wood use. In a sample of 80 households in Rajasthan who received these inserts, 71% reported using it daily, and none of the devices were damaged in any way (this was a serious problem with more complex improved stove designs). Some women reported that they do not collect wood as many times a week as they did before they received a Mewar Angithi. Those who chose not to use their inserts cited insufficient information upon receipt of the device or small chulha openings that could not accommodate the insert they received. Users reported the small device introduced no inconveniences and required no changes in their cooking practices. Compare this with the many obstacles imposed by improved stoves such as the Envirofit high-efficiency stove (described above). The Mewar Angithi is a modest or humble cookstove device in several senses. First, much like the Zimbabwe Bush Pump described by de Laet and Mol (2000), it is small in ego and heroism. Inspired by common knowledge about elevating firewood to promote better airflow, this simple design claims neither patent nor ownership, nor is it imposed with admonitions of “dirty” cooking or grandiose claims about modernity. Second, it is a technically simple device based on sound combustion principles; users should be able to easily observe how it works to improve airflow by allowing ash to fall through the holes of the insert and then, if necessary, modifying it by bending it to fit a smaller chulha. Third, the process of implementation is also minimally disruptive to current cooking practices. Unlike the Bush Pump, this insert requires very little training and its adoption is at the level of household rather than village; this suits the Bhil households in southern Rajasthan because they are dispersed across the landscape and cooking occurs at the household level. Users can also easily remove the insert if desired because installation only requires placing it in an existing stove (right-side up). Fourth, it has the potential to be a “fluid” technology with vague and shifting boundaries (de Laet and Mol 2000). It is easily adapted (to fit a small stove) and reproduced with minimal capital and technical knowledge, which makes it unsuitable for humanitarian entrepreneurship and market logics (Redfield 2016). It is also very much like the grates integral to many improved wood-burning stoves, so it simply takes one feature of many improved stoves that can be inserted into any chulha to “improve” it. In principle, it can be made with clay rather than steel. The design is simple and flexible enough to be manufactured and diffused in localities around the world, which can also provide economic opportunities in small communities. Fabio Parigi and Michele Del Viscio have already sparked insert manufacturing at a school in Nyumbani, Kenya, where students were able to make their own stove inserts with tools available to them in the village (Parigi et al. 2016). Ongoing efforts to collect data about cooking practices and impacts should improve our understanding of the insert’s ability to reduce harmful emissions and wood consumption. However, its fluid characteristics also make it difficult to measure impacts on health, environment, and social relations. The Indian chulhas that remain ubiquitous throughout rural India, despite humanitarian efforts to render them obsolete, are custom made for each home and vary depending on climate, regional food, size of utensils, and other factors. One reason for the failure of previous improved stove programs is that standardization and scaling up introduce their own problems. Small, technically modest devices such as the insert are more likely to support a foundation of indigenous and local participation in the process of generating and applying new technical knowledge. The Mewar Angithi at work. Photo by Donna Cleveland. A small, steel fireplace grate that can be inserted into most existing stoves or adapted to fit is more likely to diffuse via influence; this means technical adjustment to fit user needs can be an organic part of the diffusion process. Though we have called it the Mewar Angithi, this device, which carries no patent or trademark, can also simply be called a “stove insert” or “stove grate.” This little device, modest as it is, makes a bold claim about how people might design and diffuse humanitarian goods in ways that have the potential to democratize “expertise” and undermine the market logic that has shaped both humanitarian and development efforts to modernize cooking practices in rural India. Despite renewed efforts to transform the cooking practices of people in rural India, we suggest that humble cookstove interventions will remain important. In 2016, India’s Ministry of Petroleum and Natural Gas rolled out the Pradhan Mantri Ujjwala Yojana program, which offered free connections and subsidies for gas cylinders to families living “below the poverty line.” Though this scheme is ambitious and will no doubt move many households away from biofuel, the shift will be neither easy nor total. Women in remote parts of rural India, for example, must rely on men’s help to take gas cylinders to towns on public transport or motorcycles for exchange, but their men may not consider it worth their time to get the refill. By contrast, women do not need to rely on men to collect fuelwood. If India’s past holds any lessons, those who have gained the least from large-scale infrastructure projects related to energy due to their geographical, political, and/or economic marginalization are also least likely to benefit from the government effort to make clean cooking fuel (“clean” at the point of cooking) available to all. Many Bhil villages in southern Rajasthan, our research suggests, will continue to cook with biofuel on their chulhas for some time to come. Baviskar, Amita. 1995. In the Belly of the River: Tribal Conflicts over Development in the Narmada Valley. Delhi, India: Oxford University Press. Birkenholtz, Trevor. 2016. “Dispossessing Irrigators: Water Grabbing, Supply-Side Growth and Farmer Resistance in India.” Geoforum 69:94–105. Chandrashekhar, Vaishnavi. 2015. “Up in Smoke: Why India is Still Looking for a Perfect Cookstove.” The Caravan: a Journal of Politics & Culture. April 2015 issues. Available at link. Chatti, Deepti, Matthew Archer, Myles Lennon, and Michael Dove. 2017. “Exploring the Mundane: Towards an Ethnographic Approach to Bioenergy.” Energy Research & Social Science 30:28–34. Cross, Jamie. 2013. “The 100th Object: Solar Lighting Technology and Humanitarian Goods.” Journal of Material Culture 18(4):367–387. Dalberg Global Development Advisors. 2013. 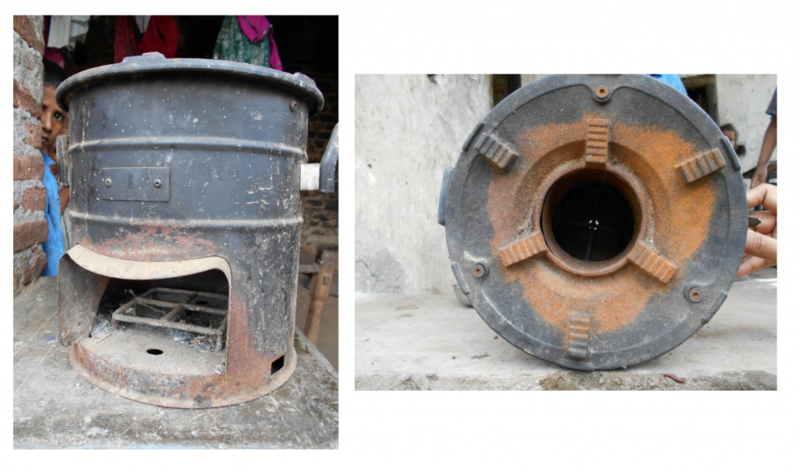 Global Alliance for Clean Cookstoves: India Cookstoves and Fuels Market Assessment. Presentation. Available at: link. de Laet, Marianne, and Annemarie Mol. 2000. “The Zimbabwe Bush Pump: Mechanics of a Fluid Technology.” Social Studies of Science 30(2):225–263. Hanna, Rema, Esther Duflo, and Michael Greenstone. 2016. “Up in Smoke: The Influence of Household Behavior on the Long-Run Impact of Improved Cooking Stoves.” American Economic Journal: Economic Policy 8(1):80–114. Jagger, Pamela. 2017. “2017 Provost’s Global Forum: Women’s Health and the Environment: Going Up in Smoke.” Paper presented at the 2017 Provost’s Global Forum “Women’s Health and the Environment: Going Up in Smoke”, University of Iowa, Iowa City, April 14, 2017. Jagger, Pamela, and Charles Jumbe. 2016. “Stoves or Sugar? Willingness to Adopt Improved Cookstoves in Malawi.” Energy Policy 92:409–419. Khandelwal, Meena, Matthew E. Hill, Jr., Paul Greenough, Jerry Anthony, Misha Quill, Marc Linderman, and H. S. Udaykumar. 2017. “Why Have Improved Cookstove Initiatives in India Failed?” World Development 92:13–27. Kikkeri, Ramesh. 2017. “Swami Vivekananda Youth Movement Experience with Cookstoves in South India.” Paper presented at the Fulbright-Hays GPA Workshop, Udaipur, Rajasthan, January 7, 2017. Parigi, F., M. D. Viscio, S. Amicabile, M. Testi, S. Rao, and H. S. Udaykumar. 2016. “High Efficient Mewar Angithi Stove Testing in Rural Kenya.” Paper presented at the 7th International Renewable Energy Congress (IREC). Dates 22-24 March, 2016, in Hammamet, Tunisia. Redfield, Peter. 2016. “Fluid Technologies: The Bush Pump, the LifeStraw and Microworlds of Humanitarian Design.” Social Studies of Science 46(2):159–183. Sarin, Madhu. 1986. “Improved Chulha Programme: Boon or Disaster?” Economic and Political Weekly, XXI(38-39):1709-1717. Sinha, B. 2002. “The Indian Stove Programme: An Insider’s View—The Role of Society, Politics, Economics and Education. Boiling Point 48:23–26. Smith, Kirk. 2000. “National Burden of Disease in Indian from Indoor Air Pollution.” Proceedings of the National Academy of Sciences of the United States of America 97(24):13286–13293. ———. 2002. “In Praise of Petroleum?” Science 298(5600):1847. Subramanian, Meera. 2015. A River Runs Again. New York: Public Affairs. Udaykumar, H. S., A. Kindig, S. Rao, M. Del Viscio, V. Kukillaya, N. Panwar, and D. Sharma. 2015. “How a Simple, Inexpensive Device Makes a Three-Stone Hearth as Efficient as an Improved Cookstove.” The Solutions Journal 6(4):53–60. Yadama, Gautam N. 2013. Fire, Fuel and the Fate of 3 Billion: The State of the Energy Impoverished. New York: Oxford University Press.